January 12, 2019 & filed under Therapy Tips. Clinical psychologist Chris Mackey provides some practical tips for when someone is having suicidal thoughts. It’s important to have a way to deal with suicidal thoughts. Roughly 1 in 3 clients who present to our psychology practice will experience some suicidal ideation. Severe and ongoing distress can hugely distort our thinking. It’s important to reach out to someone and not sit alone with your distress. Telling someone about your distress can bring great relief, even if it’s hard to do. It’s best to also see a GP or mental health professional. 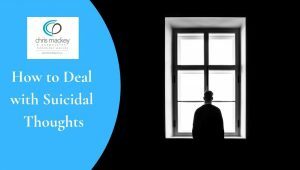 Also see our blog on dealing with suicidal thoughts. For more video therapy tips, click here.